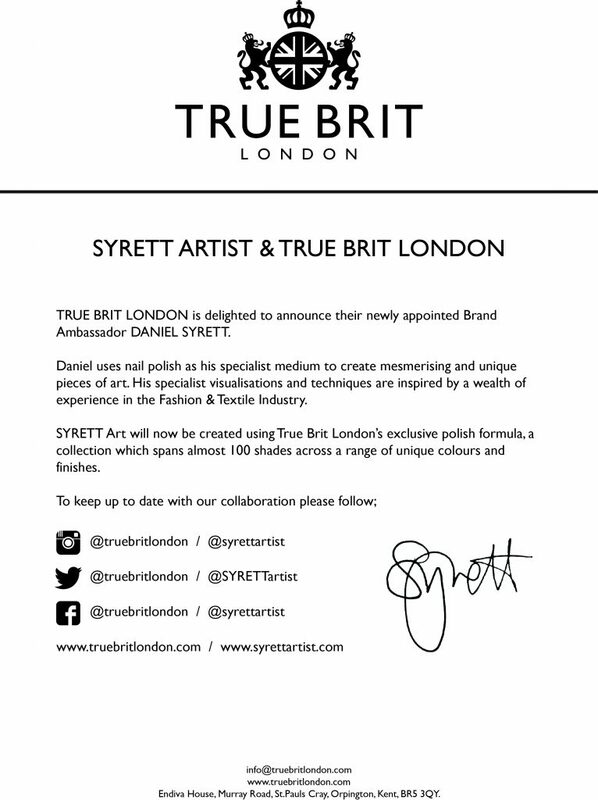 TRUE BRIT LONDON is delighted to announce their newly appointed Brand Ambassador DANIEL SYRETT. Daniel uses nail polish as his specialist medium to create mesmerising and unique pieces of art. His specialist visualisations and techniques are inspired by a wealth of experience in the Fashion & Textile Industry. SYRETT Art will now be created using True Brit London’s exclusive polish formula, a collection which spans almost 100 shades across a range of unique colours and finishes. To keep up to date with our collaboration please follow Syrett on Instagram, Twitter & Facebook.